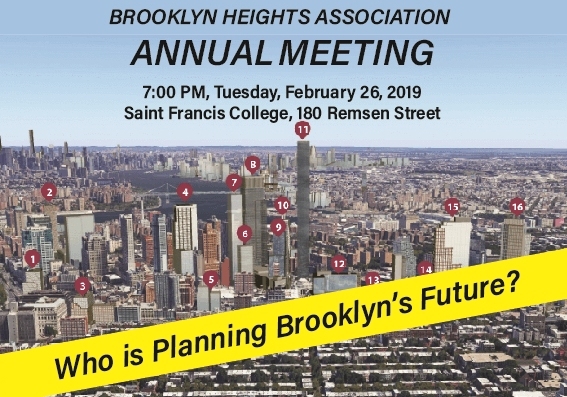 The Brooklyn Heights Association will host its Annual Meeting on Tuesday, February 26th, at 7pm. The New York Times’ Ginia Bellafante will engage in a conversation with three distinguished individuals who bring deep planning experience and different perspectives to this year’s theme: Who is Planning Brooklyn’s Future? The BHA will also review this past year, including its ongoing efforts to replace DOT’s proposed Promenade Highway with a less environmentally destructive approach to the BQE reconstruction. The BHA will bestow its Community Service Awards to the following organizations or individuals who have made significant contributions to the neighborhood’s quality of life and enhance its spirit of community. The meeting is open to the general public. Refreshments will be served after the meeting.